New Year’s celebrated twice in the UAE. The first one is Islamic New Year on the first day of the lunar month of Muharra. There’s no any fancy celebrations – only prayers and following fasting then. The secular New Year in the United Arab Emirates is celebrated according the Gregorian calendar at the same time as it’s celebrated in the majority of countries all over the world. The entertaining feast is usually very fun and actually getting grand. Pre-New Year's atmosphere surrounds Dubai with Christmas spirit and festive bustle from the beginning of December! From the first days of December, the streets and squares of Dubai are already shined with Christmas lights and New Year decorations. Hotels and shopping centers compete in the magnificence of the original dressing of Christmas trees. Festivals and Christmas fairs are held throughout the city. The main Christmas fair in Madinat Jumeirah traditionally opens in mid-December. A huge ice rink with snowmen and a workshop of Santa Claus elves in the Dubai Mall helps to create a Christmas mood to anyone who doesn’t imagine a winter fairy tale without snow. The Ski Dubai complex gives the guests the real snowy winter on the threshold of New Year. Here you can go skiing, and also you can make a snowman or arrange a funny battle with snowballs with your friends. New Year's Eve is the time of incredible parties on the beaches and the most luxurious festivities in the hotels of Dubai. Gourmet dinners, masquerades, discos and festive shows with celebrities take place almost throughout the city. If you’re fond of exotic you can spend this magical night around the campfire in the desert. You have only to choose which version of the meeting of the New Year is interesting for you! Tremendous and terrific New Year fireworks in Dubai got into the Guinness Book of Records a couple of times. The fire show begins in the first minutes of the New Year simultaneously in several places of the city. The most ambitious fireworks erupt at the highest skyscraper Burj Khalifa, near the famous hotels of Burj Al Arab, Atlantis The Palm and throughout the territory of Palm Jumeirah. Completely different fiery performances are held in each of these places. But they all fight for the title of the most original and luxurious salute in honor of the beginning of the New Year. The perfect way to enjoy all the shows at the same time is to rent a boat and go out into the open waters of the Persian Gulf. Every year, a huge number of people want to admire the grand fireworks. Therefore, it is necessary to occupy places convenient for viewing or to reserve tables in nearby restaurants in advance. A Dubai marina cruise is one of the most popular options for celebrating a secular New Year. This is an unsurpassed opportunity to avoid the hustle and bustle of a crowded holiday, but not to miss the magnificent pyrotechnic spectacle. The best panorama of the city fireworks and festive shows on the beaches appear before the guests in the open waters of the Persian Gulf. 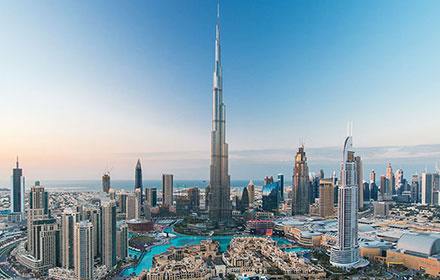 There are several options to celebrate the New Year on board in Dubai. You can join a group cruise on a yacht with a holiday table and a disco, attend a New Year's party on a traditional Arab dhow boat. 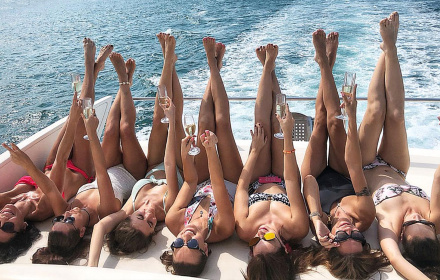 There is always an opportunity to rent a yacht in Dubai for those who prefer to spend the holiday only with their dearest and nearest. Luxurious Sea Boats Charter offers you an exclusive New Year's cruise with the highest level service!